Chincoteague Island, on Virginia’s Eastern Shore, can be your starting point for an unforgettable RV camping vacation. The timeless beauty of Chincoteague draws visitors all summer long to hike or bike to a wildlife refuge, kayak in Chincoteague Bay or watch for dolphins from a picturesque lighthouse. Unspoiled by over-development, it’s as close to nature as you’ll find on the Eastern Seaboard. Coming to Chincoteague by RV is the perfect choice for several reasons. Thanks to the variety of campgrounds in the area, it’s possible to maximize your family’s vacation activities. Chincoteague campgrounds are close to area attractions and most also offer access to clamming, crabbing, boat rentals, scenic land and water tours and other outdoor recreation favorites. Here’s one more bonus: knowing you’ll be coming home to sleep in RV comfort and can cook when you choose in a well-equipped RV kitchen makes vacationing that much more relaxing. Now that you know you’re making the right choice traveling by RV, here are even more reasons to take an RV camping trip to Chincoteague Island. An extraordinary place divided between Maryland and Virginia (and a stone’s throw from Chincoteague), Assateague Island is home to Chincoteague National Wildlife Refuge, where wild ponies play among the dunes. On the last Saturday of July, those ponies swim the narrow channel between the two islands in preparation for the Pony Auction held annually to reduce the herd to limits allowed on the island. Tip: If your family is planning to attend this amazing event, plan to park at the school on Chincoteague and take the shuttle to avoid the congestion. Kayaking, hiking, wildlife viewing and saltwater fishing are other favorite activities for visitors to Assateague. Take the time to visit Assateague Lighthouse, a quick drive or bike ride from Chincoteague. Built in 1833, the light’s attractive red and white tower promises wonderful vacation photos and a chance to climb the steps to the top for even better views. There are Assateague Island RV campgrounds on the Maryland side, if you enjoy ‘boondocking’ with no hookups and cold water showers. It’s best to plan on camping here during the week in the summertime, as weekend sites are booked months in advance. Find time to come to Virginia’s Eastern Shore this summer. Whether you come to ride a horse along the beach, learn the history of Assateague and Chincoteague on a boat tour, paddle your way through the area’s many water trails or photograph the sun setting over the dunes, your time on these islands will be magical. And did we mention the area is famous for its summertime festivals? Be sure to ask your campground host what’s coming up so you won’t miss any of the fun. 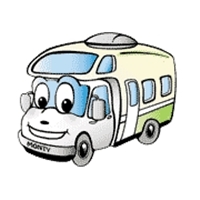 We’d love to help you with a Virginia or Maryland RV rental, as well as more information about area activities. Use this link to make your reservations at your favorite Virginia campground and start planning your own Chincoteague Island RV camping vacation. This entry was posted in Virginia RV Camping Vacation. Bookmark the permalink.